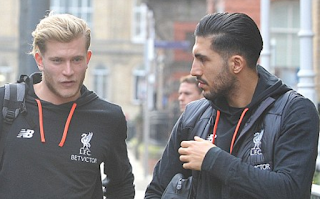 Is Emre Can set to make his return from injury tonight against Everton? “It’s painful. I never heard about this ligament, but it’s a little bit damaged. He [Can] is in doubt for Wednesday". Well, appears that Can is indeed back. The German arrived at the club's pre-match hotel in Liverpool today alongside the likes of Henderson, Karius, Lallana, and Firmini, which suggests he's in the frame for tonight's game. There was no sign of Joel Matip, though, which unfortunately means he's certain to miss the match. As for Can - given the physical challenge posed by Everton (something Klopp specifically referenced in his pre-match press conference), I'd expect to see the German midfielder replace Wijnaldum in the starting XI this evening. Whether that's a good idea is, however, debatable. There's no urgent need to rush Can back into the team; it arguably makes more sense to start him on the bench, but like Lallana, Can is one of Klopp's favourites, so he'll probably start the game.